Home » iphone » Kleenex » online game » petrol » purchase » spend » vouchers » Kleenex Softness Challenge: Win an iPHONE X! 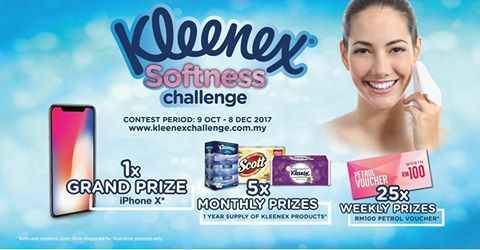 Kleenex Softness Challenge: Win an iPHONE X! Purchase a minimum of RM15 worth of Kleenex products in a single receipt to participate. To Register, simply fill in your Name, NRIC, Address, Email, Mobile & upload a picture of the Receipt* as proof of purchase. To Play, simply START pulling as many tissues within the 60 seconds. You have 5x chances* per receipt to achieve the highest score. Visit Kleenex Softness Challenge website for more details.